If you consider the high costs of new appliances, countertops, and upgraded cabinets, it’s easy to see how expensive renovating your kitchen can be! While few homeowners have the time or budget to tackle such a big project all at once, many are finding more cost-effective alternatives to update their kitchen. How? Refinishing or repainting your kitchen cabinets can beautifully transform that space entirely without exceeding your budget. If your existing cabinets are in good condition, why throw them out when all you need to do is give them a little TLC? Add some fresh paint on the walls, and voila—an updated look for a fraction of the price of a major kitchen renovation. Before you get your project underway, it’s important to understand what to expect. Here are some steps to follow so that your kitchen painting project gets done right. Repainting your kitchen essentially means that a vital room in your house will be off-limits for a while. To prevent spending extra money ordering takeout every day because you cannot cook, set up a temporary kitchen area in your home. You can invest in a hot plate, move your toaster oven, and use a plug-in cooler as a fridge in the meantime. If your sink area is out of reach, use paper plates and recycle them when you’re finished. If you are having your walls painted with a fresh coat as well as your cabinets, make sure you prepare them before the painters get to work. Any holes in the walls should be filled in, dried, and sanded smooth. A clean, dry surface is necessary for the painters to apply their primer and repaint your kitchen walls for a brand-new look. If you aren’t sure how to prep your walls on your own, your kitchen painting contractor will be able to fill any holes, cracks, and damaged areas in your cupboards, ceilings, and walls. They can also sand any scuffs or scratches to smooth the surface. You may think it is possible for the painters to work around the shelving and hardware on your walls, but this is far more complicated and impractical than you think. If they aren’t removed before your new paint job, you will end up with an area with the old paint colour exposed should you ever decide to take down your shelves later. Hardware on your walls can include clocks, shelves, electrical plug covers, hanging art and photos, curtains, cable and phone outlet covers, nails, and light fixtures if your ceiling will also be painted. If you are worried that these items might get lost, wrap them in bubble wrap and place them in a plastic container, labelling them based on where in the room they belong. You can also take pictures of each of the walls before removing the items, so you can replace them in their correct spots after the repainting project is complete. When you are having your kitchen cabinets or kitchen walls repainted, you need to remove the items underneath and around them. This includes appliances like the stove, refrigerator, and microwave. A microwave may be easy to move, but if you cannot completely move the larger appliances on your own, ask for help from a friend. You can also talk to the contractors ahead of time about your concerns and ask them to move all your furniture into the middle of the room and cover them with clean plastic sheeting. Before your professional painters can work in your kitchen you will need to be sure that your kitchen walls, floors, and cupboards are clean of any dirt and food. Spray a degreaser onto a cloth and wipe all the surfaces to remove any oil. If there is any grease or oil on the surfaces being painted, the primer may not cover as well, and grease spots might show through. You should also clean the surfaces of your drawers and cabinet doors—especially areas that are exposed. You can also take this opportunity to wipe off any dirt from the walls and give your floors a good sweep and mop. A clean area will help your painters navigate easily in your kitchen and will make the room look much better once the job is done. Another important step you should not forget is to protect your furniture and flooring from any paint splatters. Paint can be messy, so you should place drop sheets all along your floors, and your walls if you are not having them painted. The interior painters you hire will cover the floors with drop cloths to protect them and tape them down, so they don’t move around. Also make sure to use proper protective tape to protect your mouldings, window frames, and door frames. Why Choose Booth7 for Kitchen Refinishing and Painting? Booth 7 is a one-stop shop for customers looking to give their homes a fresh new style without breaking their budget. There are many options available to upgrade your kitchen without spending tens of thousands of dollars on a full-scale renovation—kitchen cabinet repainting is just one of them! We provide our customers with high-quality, professional painting services and pride ourselves on our excellent customer service. At Booth7, we have a state-of-the-art facility that includes a professional closed spray paint booth with superior ventilation and equipped with everything necessary to complete your project(s). Your home and environment are important to us, so we only use water-based paints and solvents, so our customers never have to worry about lingering paint smells and breathing in hazardous paint fumes. We handle all the details of your kitchen refinishing project from start to finish, so you can count on us to get the job done right! To get started on your kitchen renovation, give us a call today. We should return your call immediately, but if not, it’s always within a few hours! Have an idea of what you want your kitchen to look like? Send us a photo of your existing kitchen and get a free consultation and estimate. 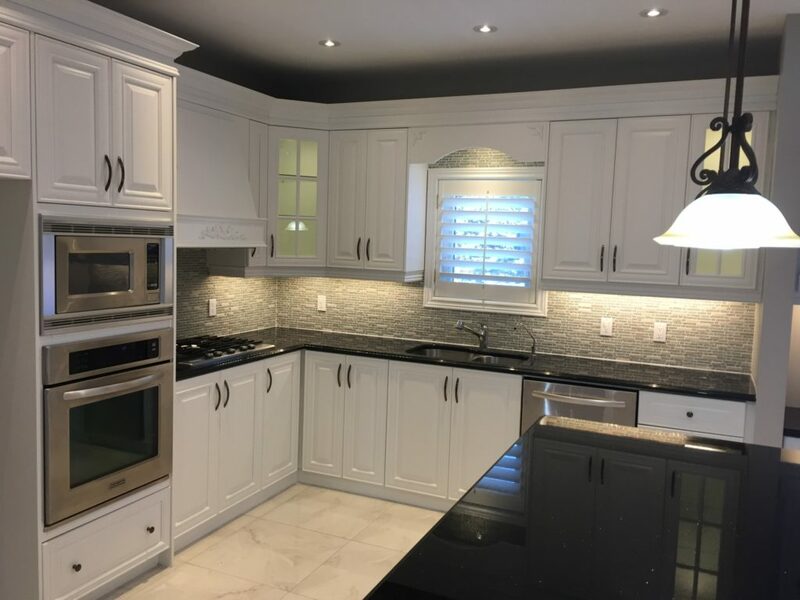 We are available seven days a week to answer your inquiries and to ensure your kitchen cabinet refinishing project goes as smooth as possible. For more information about our services, please fill out our online form or contact us at info@booth7.com.